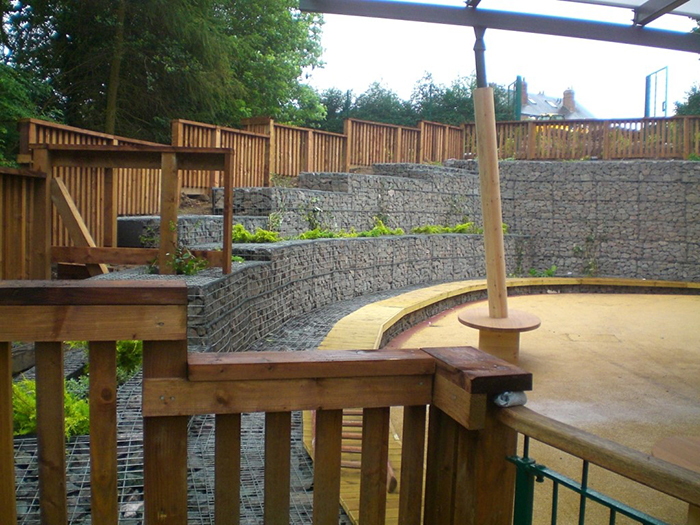 Gabion mesh & baskets have been used in the construction industry for many years as a method of embankment stabilisation or erosion protection whilst also providing an aesthetic finish using different stone finishes. Our new Garden Gabions range of baskets offers a smaller more compact system of meshes and baskets that can be adapted to provide a new modern and minimalistic visual feature to any garden or park. 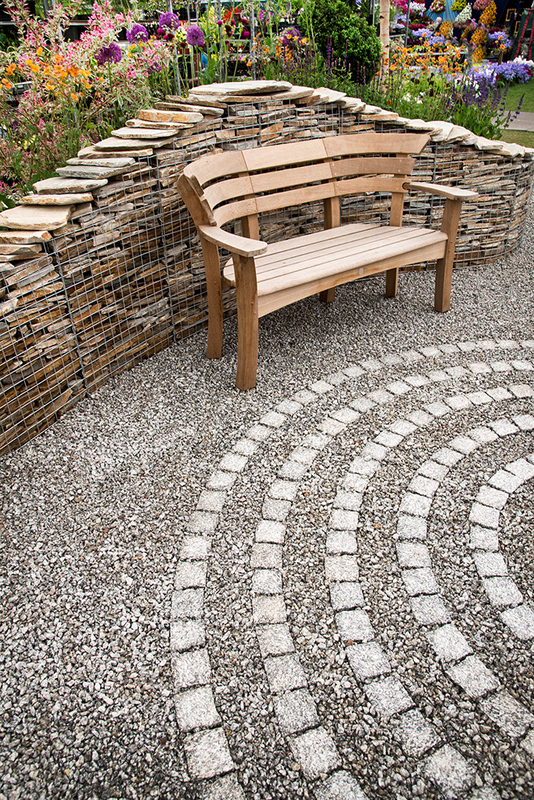 The adjacent gabion designs include a display recently selected to be included in the featured garden at the Royal Chelsea Horticultural Show within the perennial category. The agreed design utilising a curved wave design providing varying heights along the perimeter of the raised beds. A yellow Cotswold type of sand stone was selected in thin slate like stones to provide a natural rustic wall finish that complimented the vast array of perennials that were selected for the exquisite final showing. The advantage of this new system is although a number of standard items such as benches, planters, water features are readily available it is more excitingly a bespoke development. In addition to these standard items the system can be designed to incorporate the requirements of your garden or area e.g. 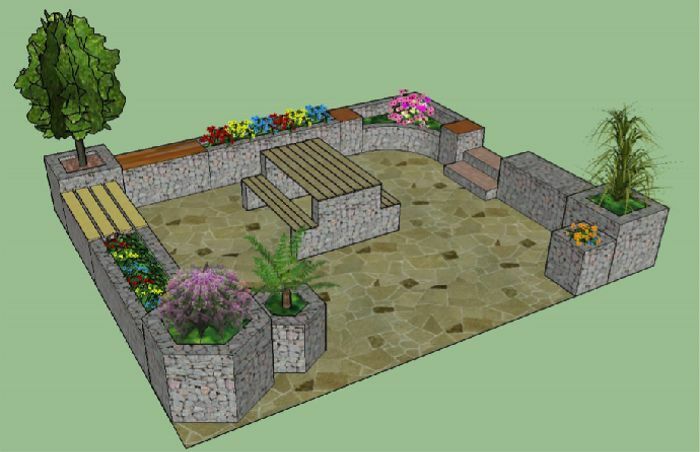 a small retaining wall could be constructed whilst incorporating raised planters, trellis, water features even to include cladding to a shed, garage or outbuilding. 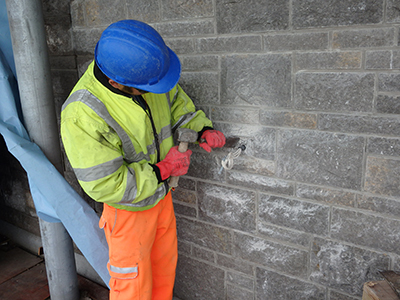 Finishes are all important and this system gives you the ability to select whatever finish you prefer, stone, slate, pebble, brickwork, pipes, logs, driftwood, bottles the list is endless and all at your request. Call us/Book an appointment: We are happy to just talk or arrange to visit potential locations, measure and photograph the nominated area and discuss your requirements and offer advice. Provide a Design: We will then provide 2D / 3D designs following a brief provided by you and amend or adjust to suit your requirement. Quotation: If you agree on the design we can provide you with an itemised quotation. Either Just supply of baskets and ancillaries or installed to include the supply, ground preparation, fill materials (stone etc) to complete the project. Construction: If acceptable a program would be put together to give a complete communication of works that will take place. Again by agreement to fall in with your needs.